The Denver Broncos are entering their bye week with a 6-0 record and a comfortable four game lead in the AFC West. They are one of the five remaining undefeated teams in the league, and their defense is on pace to go down as one of the all-time great defensive units in NFL history. Yet, due to their offensive struggles — they rank in the bottom third of the league in nearly every major statistical category — there is very little optimism around the league in regards to the Broncos’ chances at winning, or even appearing in, Super Bowl 50. We recently gave our readers an in-depth look at what we believe is the root of the Broncos’ offensive problems. 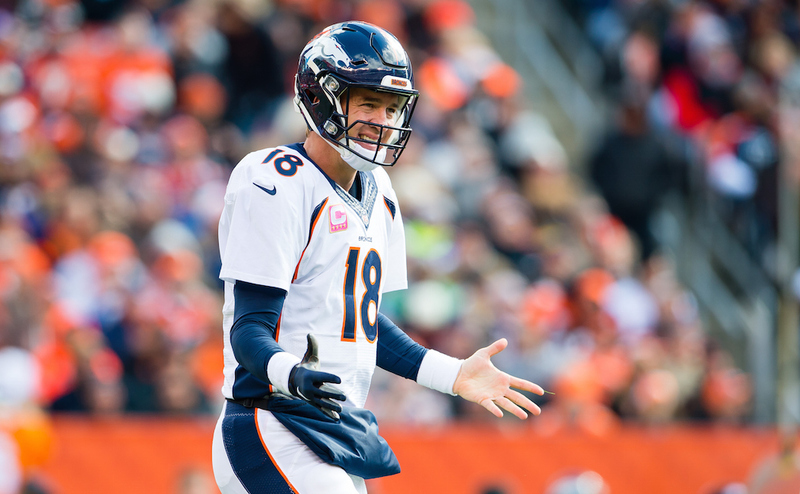 In case you missed it, the issue isn’t 39-year-old quarterback Peyton Manning, as several members of the sports media would lead you to believe. The problem has actually been the play of the team’s offensive tackles and tight ends. At this point in the season, what you see is pretty much what you are going to get in terms of roster composition and starting lineups. Given the value that NFL teams place on offensive tackles, it would be unrealistic to believe that the Broncos have a chance at trading for an impact player at the position. And it would be even more unrealistic to think that Denver can find a street free agent offensive tackle that will be able to help them win a Super Bowl. The more likely scenario, and one that actually has a remote chance at happening, is that the Broncos swing a deal with a team that is out of playoff contention for a premier tight end. 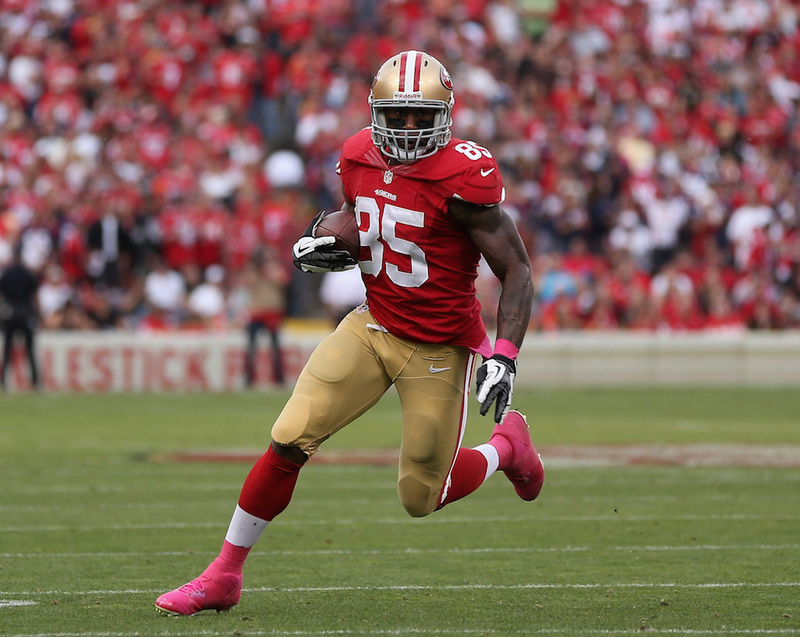 If the Broncos were to consider making an in-season move to improve at the tight end position, two names immediately come to mind: Vernon Davis of the San Francisco 49ers (pictured above) and Martellus Bennett of the Chicago Bears. Both players would offer Denver an instant upgrade over their incumbents, Owen Daniels and Virgil Green, even if it took them several weeks to become comfortable with head coach Gary Kubiak’s offensive playbook. First things first, Denver has the salary cap room to comfortably take on the remainder of either player’s contract, meaning there will be no financial road blocks that could stall a potential deal. We’ll start by looking into the possibility of Davis joining the Broncos. This move actually makes the most sense to us, seeing as how Denver inquired about the 31-year-old’s availability this past offseason. At the time of the inquiry, Davis was not on the trading block, but a lot has changed since then. The 49ers are falling out of postseason contention, and are now rumored to be motivated to move Davis, especially since his contract is set to expire at the end of the season. For this trade to happen, the Broncos will likely have to be willing to part with a fourth round draft pick at the very minimum. 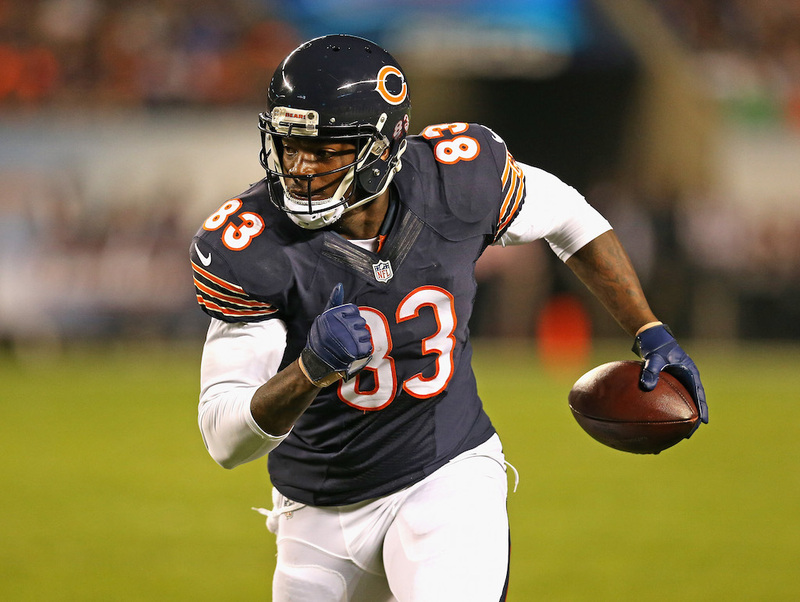 The situation regarding a possible trade for Bennett (pictured above) is far more complicated. The 28-year-old tight end appears to just now be entering his prime and won’t hit unrestricted free agency until the 2016 season comes to an end. On top of that, most NFL scouts and coaches will tell you that Bennett is better than Davis as an all-around tight end. Acquiring Bennett from the Bears would likely cost the Broncos a third round draft pick at the very minimum. Both Davis and Bennett have the ability to add a whole new dimension to the Broncos’ struggling offense. They would both be vastly better receivers than any of the tight ends on Denver’s roster, giving Manning a solid target over the middle and in the red zone. Furthermore, the addition of either player would go a long way in helping to strengthen the Broncos’ subpar run blocking during the stretch run of the season. In our opinion, a trade for Davis is the more likely scenario. However, we would also be shocked if Broncos’ General Manager John Elway doesn’t at the very least inquire with the Bears about Bennett’s availability. With that being said, if Denver is able to land one of these players prior to the November 3rd trade deadline, it could prove to be exactly what they need to solve their wide array of offensive problems.